It’s a winter wonderland in Grand Marais and the snow just keeps falling. The temperatures have been hovering around zero but when the sun is shining and the wind isn’t blowing it’s quite nice outside. Most people who live in Cook County Minnesota embrace Hygge year round and in February we invite everyone to experience it during our Hygge Festival. Pronounced “hoo-ga,” this Danish concept can’t be translated to just one word but encompasses a feeling of cozy contentment and well-being through enjoying the simple things in life. Think wool socks, fuzzy blankets, comfort food, candlelight and spending time outdoors frolicking in the snow with friends and family. This February 8-14th is the 3rd Annual Hygge Festival and you’re invited to snowshoe, cross-country ski, ride a fat tire bike, tour fireplaces and experience Hygge in Cook County. 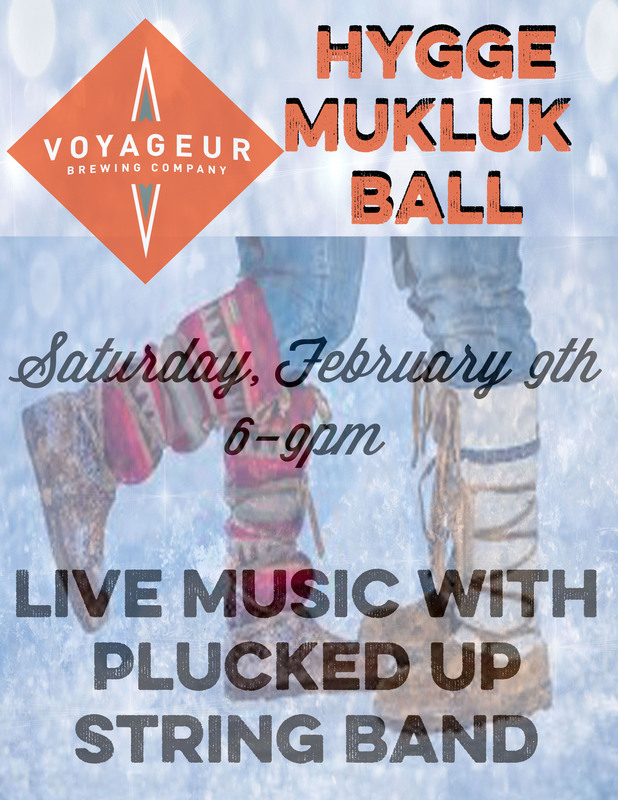 We’ll have a fire in our fireplace, hot soups on the stove, board games to play, a chalk art demonstration and our 3rd Annual Mukluk Ball at Voyageur Brewing Company. 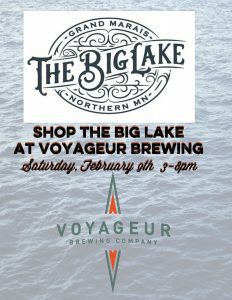 We hope you will take time to experience Hygge with Voyageur whether it’s sipping on a Palisade Porter in front of your own fireplace or enjoying a beer in our taproom. We’ve got great news for folks who are looking for a place to eat or grab a pint of beer to drink in Grand Marais. We will be open 7 days a week at 11:30am beginning February 4th. We have soups, salads and all of our fantastic menu items available as well as our terrific selection of craft beer. Now on tap the Saganator Doppelbock! Like Big Saganaga Lake is to Little Saganaga Lake in the Boundary Waters this beer is a bigger and stronger version of the traditional German-Style Bock beer. “Doppel” means “double,” and while the 8% ABV of Saganator may not be double the amount of alcohol in a typical craft beer it is quite substantial. The Doppelbock was originally brewed as a beer to sustain monks during lengthy fasts, particularly during the Lenten season. Monks are sometimes featured on beer labels because they historically raised money for their orders via brewing beer. The Paulaner monks were the first known to have brewed a doppelbock and they named it “Salvator” after the Savior they worshipped. This beer was dubbed “liquid bread” for its satiating qualities and soon other breweries began making their own version of “Salvator.” They called it as such until a law passed and they were forced to come up with a new name. Most of them chose some variation of “Salvator” and that is why many doppelbocks have “-ator” in their name; hence the reason we call ours the Saganator. It isn’t Lent and you don’t need to fast or be a monk to enjoy our delicious doppelbock beer. We know you’ll love the big tasting Saganator Doppelbock. 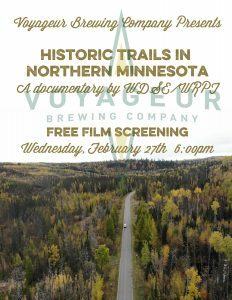 We’re hosting a film screening at Voyageur Brewing on Wednesday, February 27th and you’re invited. In WDSE•WRPT’s documentary, “Historic Trails in Northern Minnesota”, we’ll follow the Gunflint Trail, Voyageurs National Forest trails and Mesabi Trail through their fascinating pasts, their multi-faceted modern uses, and explore what lays ahead for these winding paths. 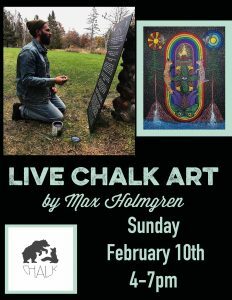 Our upcoming music line up includes Jim McGowan February 1st, Timmy Haus February 7th, Matt Browne February 8th, Plucked Up String Band February 9th, Colleen Myhre February 15th and Matt & Laurel February 22nd. Our craft beer selection includes Saganator Doppelbock, Jock Mock Heller Bock, Sled Hound Session IPA, Brule River Blonde, Thirsty Camper Vienna Style Lager, Lost Compass British Imperial Stout and our four flagships.